About four months ago I started photographing some of my favourite things in the Dubai, and neighbouring areas, where I’ve lived for the past eight years. I took snapshots of locally available food items, unique restaurants and cultural and social spaces that have become dear to me over the years and, in the end, have made this place feel like home. I planned to compile the photos into a blog, along with a short description of each of my choices, to give others a glimpse into some of the valuable little discoveries that have enlivened my daily experience living in the UAE. I didn’t realise when I started the creative process that by the time I actually got around to putting this blog together, I would be less than 10 days away from leaving Dubai indefinitely. This project ended up being more for me than anyone else – a way of capturing some of the fleeting colours and flavours of my daily life that are easy to take for granted, but that I will miss dearly when I move away early next month. 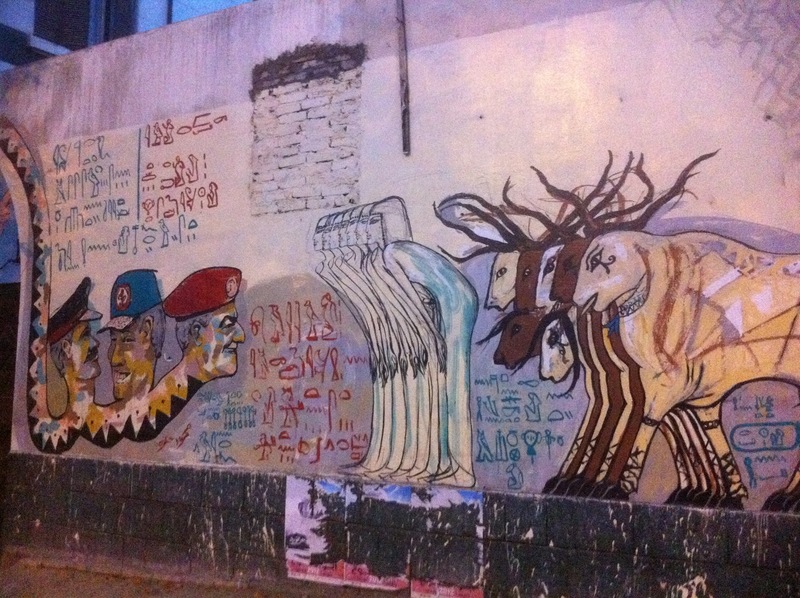 On my first visit to Cairo since last year’s popular uprising overthrew Hosni Mubarak following three decades of rule, I was inspired and moved, sometimes to tears, by the graffiti and public art that now decorate the city. One memory from my childhood was watching my mom sit at the kitchen table with a pen and stack of lined loose-leaf sheets of paper to write one of her three sisters a long letter, handwritten in attractive Arabic script. This was one of the only activities that could draw mom away from her rigorous daily routine of managing every family affair and caring for three daughters with boundless dedication. Taking the time to write letters was a rare respite for our supermom. She would become immersed in her thoughts and intently focus on the blank sheets in front of her, as well as the multi-paged letter she’d received in the mail a day or two prior and was then replying to. I received the greatest birthday present of my life last week. 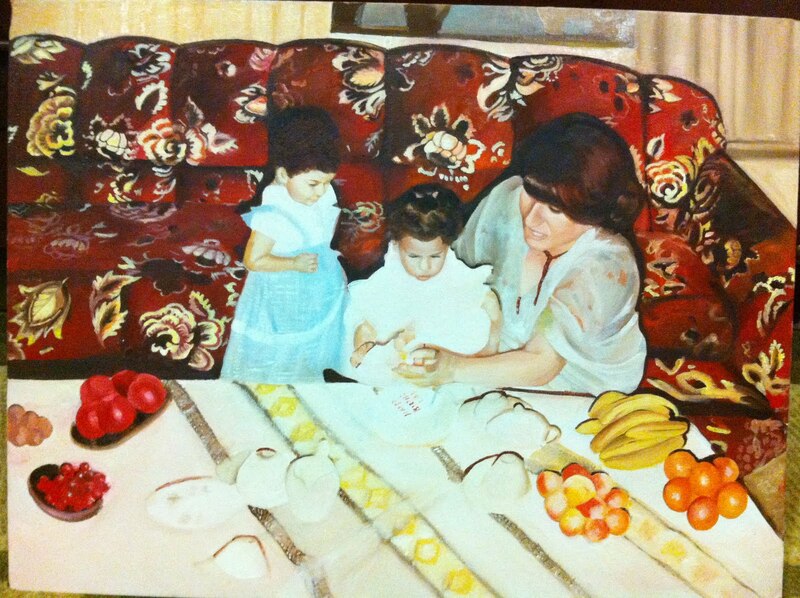 My younger sister re-created a moment of my childhood in a painting depicting me as a baby celebrating my first birthday with my mom and elder sister. The three of us are kneeling before the living room table of our apartment in a suburb of Toronto, Canada. My mom had covered the table with a selection of fruits and pastries placed carefully upon a table cloth, which she always did when we had guests over. It is a painting rich in colour, detail and memory. For much of my childhood we had this bright, flower-print red couch with two matching side chairs bought when my parents first immigrated to Canada from Egypt in the late 1970s. My father was completing his Master’s degree in electrical engineering and my parents were living in a small apartment in Ontario, where they had their first two daughters. The couch was my mom’s first furniture purchase after marriage and she recalls being very excited with it. As we moved from one city to another with my dad’s changes in employment, my sisters and I wore down that couch, which my parents gave away about 10 years the birthday party depicted here. But in this painting, it was still brand new, much like I was at the time. It was wonderful to watch my younger sister recreate this moment on a canvas with oil paints, paying attention to many intricate details – my mom’s lovely features and thick auburn hair wrapped in a braided bun on the side of her head, the table cloth that appears in many photographs through the years and is still stored in a dining room cabinet. Rather than being tucked away in a photo album that is rarely opened, this moment of family history will now be framed and hung in my own living room to become part of my present and future.